Fourteen years ago, owners Lili and Paul Romano had a vision. They came to Pavones after many years of traveling Mexico and Central America and were captivated by the pure beauty and simple lifestyle that existed there. They purchased the 11-acre cow pasture and transformed it into what is now Mira Olas, a tropical retreat. Fruit trees, exotic hardwoods, organic gardens and spiraling floral pathways welcome you. The retreat is located on the edge of primary rainforests and borders the banks of the pristine Rio Claro River (Clean River). At the top of the property above the palms and fruit trees is a panoramic view overlooking the Gulfo Dulce and Osa Peninsula. From this location you can check the surf and enjoy spectacular sunsets.It was nightfall when we arrived. It is always a mystery to me that this is the only place in all of Costa Rica where the bugs do not bite at dusk. An enchanting dimly lit pathway led us up to our two-story deluxe cabaÒa. Lili helped us in and was very hospitable. I could see Lili's European influence in the simple chalet design with teak frame, open, spacious and clean interior and plenty of built-in shelving. There is a full kitchen, dining area, bedroom and bath downstairs and a loft upstairs with two beds. The CabaÒa comfortably sleeps four and is ideal for families. Best of all is the deck that overlooks a variety of fruit trees, lush gardens and beautiful sunsets. Further up the hill is the main cabaÒa and home to the Romano family, Paul, Lili and Erica. Down across the pathway is the rustic pine cabaÒa where our friends Donna and Mitch stayed, making us instant neighbors over the holidays. It is an open cabaÒa, which sleeps three comfortably. There are two rooms and a fully-equipped kitchen upstairs with bathroom downstairs at ground level. Between us was two more cabaÒas that will be completed in the spring of 2005. Each one-room cabaÒa has a bathroom and accommodates up to three people. There are no kitchens. All the cabaÒas at Mira Olas are private and quiet with electricity, fans and safe drinking water. 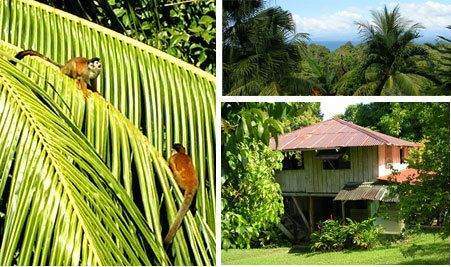 Eco-friendly lodging comes naturally here using minimal resources and they recycle everything. Compost bins are provided in the kitchens. 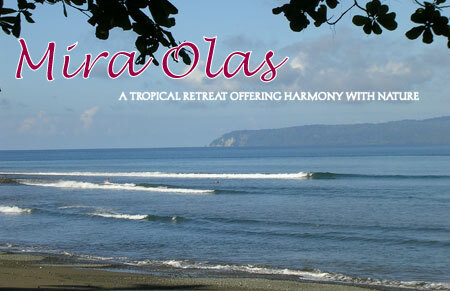 Mira Olas is an ideal retreat for friends and family to get together, providing the perfect setting for groups. The Romanos are gracious hosts, offering stimulating conversation about the area and are very helpful in assisting your needs. In addition, there are several homes located near Mira Olas, which Lili rents for approximately $220 per week for two guests. We were busy unpacking when the produce truck pulled up, a regular occurrence on Mondays. One good thing about Pavones is that you can help yourself to the incredible variety of fruit on the trees on the property, such as sweet and sour star fruit, water apples, bananas, mangoes, sour sap, annonas, citrus trees, jackfruit, plums, mongosteen, cashews, cacao, and of course, coconuts. Beer trucks also selling rum and wine come to the town weekly. You can always find fresh fish daily from the fishing boats beached in the afternoons down the road. We took the five-minute walk into town that night along the palm-fringed shoreline. The last time we visited was two years ago, and it might as well have been yesterday. The cantina was still hopping with local cowboys and visiting surfers. A surf shop, internet cafe, grocery store and soda shop borders the soccer field. Restaurants serve typical Tico style salad, meat, beans and plantain dishes. Our eight days at Mira Olas were some of the most memorable of the entire trip. We were at home there. I savored the mornings watching the petite Titis squirrel monkeys eat the fruit from the trees off our deck while we sipped our morning's coffee and enjoyed Lili's fresh-baked and healthy Christmas pastries. Erica, Romano's daughter and artist, became lifetime friends with Deanna and Ryan as they hung out with the local children. In the early morning, my children would take off with Erica, her truck and their surfboards, down the short trail through primary rainforests to the crystal blue waters of the Rio Claro. There they would float downstream to the river mouth for a day of glorious surfing. They might catch a bite somewhere in the village. Sometimes I would not see them all day and yet I knew they were always safe. In the afternoon, you could hear them playing chase, hide and go seek in the jungle, or rocking out to Latino Pop up the hill. Life is full of freedom at Mira Olas and brings forth the wonderful sensation of being alive and well. I suggest spending at least a week here, 2-4 weeks is ideal. The recreational options in Pavones are endless and Punta Matapalo is just a 20-minute boat ride across the Gulfo Dulce. We spent our days surfing, hiking, snorkeling and meeting wonderful people. One can regain the joy of experiencing the simple pleasures in life such as sitting for long periods observing the surrounding wildlife. The scarlet macaws with streaks of vibrant color above one's hammock while leaf ants carrying patches of leaves on their back file across a jungle trail. 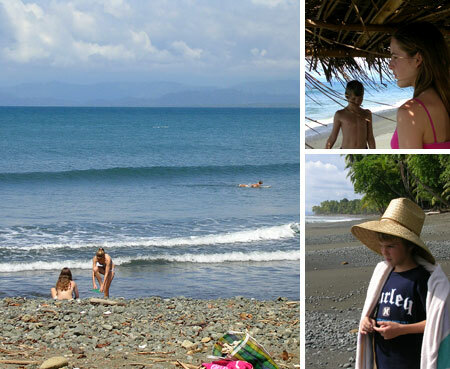 Mira Olas was a unique opportunity for our family to spend quality time in a setting that nurtures community and our love for nature and the ocean. 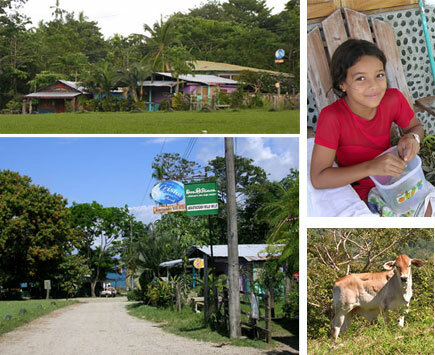 The warm and generous people of the area provided a welcoming experience to briefly meld into the beautiful simple culture of Southern Costa Rica. Story and photography by Denise D. Stansfield. Copyright ©2003-2005 All Rights Reserved.